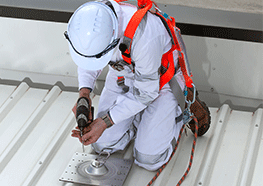 Sayfa Accredited Installers represent our products and services to the height safety industry. And what they do and how they do it is a complete reflection of Sayfa. For that reason we are very selective as to who we choose to install our systems. At Sayfa we stand behind our Accredited Installers. We offer full technical and design support. They can feel confident in the knowledge that our products are easy to install, guaranteed to last and adaptable to all situations and requirements. Not to mention, we are on call to answer all their queries - no matter how difficult. Please contact Sayfa on 1300 301 755 or info@sayfa.com.au for your nearest Sayfa Accredited Installer. Interested in becoming a Sayfa Accredited Installer? Please note: This is a basic guide for your use only and Accredited Installer status is at the discretion of Sayfa Group.